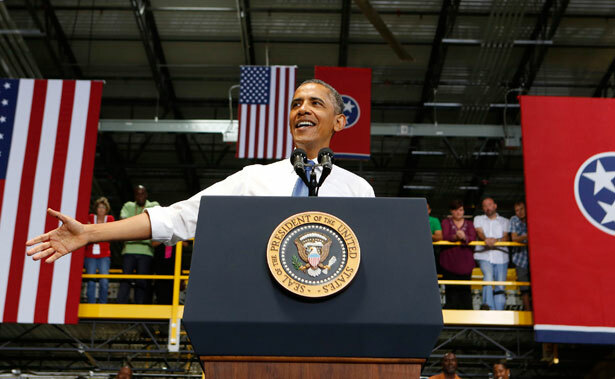 Obama’s better bargain is a disturbing snapshot of a skewed political system. President Obama introduced yet another plan to create jobs and pump the sagging economy yesterday, pitched as a “grand bargain” between Republicans and Democrats (or more accurately, Democrats and the business community). It’s perhaps not a terrible plan considering the current political atmosphere. But taking one step back, Obama’s offer is a deeply revealing snapshot of a dynamic that’s become deeply skewed and perhaps hopelessly corrupted. Obama’s bargain is this: on the one hand, Congress should enact revenue-neutral corporate tax reform, in which the corporate tax rate is lowered from 35 percent to “no higher than” 28 percent, while broadening the corporate tax base by closing loopholes and exemptions. There would also be a repatriation holiday for overseas profits—meaning that corporations would pay an as-yet unspecified “levy”, and could then bring home the $1.3 trillion they have parked overseas without subjecting it to the normal corporate tax rate. In exchange, the revenues from that repatriation levy, along with some initial, one-time revenue from changing the corporate tax code, would fund a variety of worthwhile initiatives aimed at job creation—from an infrastructure bank to funding for community colleges and creating ten “manufacturing institute hubs” nationwide. But is this what the country has come to? Consider the context, and it’s stunning. Unemployment is still at crisis levels, and is recovering more slowly than during any previous recession. In fact, throughout the recovery more unemployed workers have been leaving the labor force than have found work. Eighty percent of US adults struggle with joblessness, near-poverty or reliance on welfare for at least part of their lives and half of the US population is currently considered poor or low-income. Meanwhile, corporate profits are sky-rocketing to all-time highs, and the Wall Street stock indices are booming at pre-crash levels. The corporate tax burden, meanwhile, is already at historic lows, and the United States collects less corporate taxes as a share of GDP than all but one other OECD country. Corporate America has so much cash it can just stash over a trillion dollars overseas and just park it there until given a chance to bring it back. Inequality—the gap between the have and have-nots—is widening to historic and alarming levels (the top 1 percent own 40 percent of the nation’s wealth, while the bottom 80 percent hold 7 percent of it). It’s actually accelerated faster during the economic recovery and Obama’s presidency, as corporate profits bounded back and most of the regained jobs have been at the lowest wage rung. In this context, Obama’s proposal is, in a word, insane. Through the repatriation levy, he’s essentially resorted to bribing an already-engorged corporate sector and its shareholders with even more money (savings from not taxing massive overseas income), in exchange for taking a fraction of that gift and steering it towards some job creation efforts. The last time there was a repatriation holiday, businesses used 92 percent of the money they had stored overseas simply to fatten shareholders and executives—despite industry claims it would create jobs—while continuing to lay off thousands more workers. The Obama proposal is essentially an acknowledgment that that will happen again, and so instead resorts to the as-yet unnamed levy to fund job creation efforts. It’s like to begging for a loaf of bread on Park Avenue after you clean someone’s penthouse. Meanwhile, the Obama plan is an assurance to corporate America that it will have to play no part in the ongoing deficit reduction talks. While deficit hysteria is overblown, it is still true that ultimately the government is not bringing in enough revenue. (See some charts from Citizens for Tax Justice here). By enacting “revenue-neutral” corporate tax reform, corporations are assured they won’t have to kick in anything towards fixing that problem. Whatever money is realized from closing loopholes is plowed right into lowering the corporate tax rate. Again, there is certainly an argument to be made that this plan is a political necessity. I don’t particularly agree, but that’s another post. No matter one's feelings on that, however, one thing is clear from looking at Obama's plan: who holds the real political power in America, and who doesn’t. It’s as big as—and reinforces—the wealth gap.